Supercharge your life by training under a global martial arts legend. 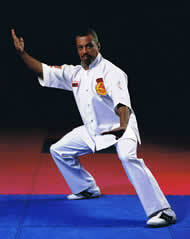 Welcome to the official online presence of Grand Master Dennis Brown's celebrated Shaolin Wu-Shu Training Centers. 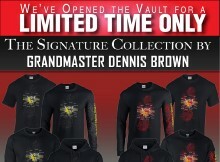 Black Belt magazine named Dennis Brown one of the "25 Most Influential Martial Artists of the 20th Century." Our Grand Master is uniquely the real deal, and so are his three Training Centers. More and more people are coming to a broader understanding that classic kung-fu is about so much more than fighting. The Training Centers offer wellness-tested physical, mental and lifeskill benefits appropriate to students as young as four or as senior as you want to be. Whatever your age, in shape or not, we have classes of interest	to you. The Wu-Shu ideal is graceful yet explosive power is instantly available in a head-to-toe healthy body. Among our instructors are masters of classic tien shan pai fighting and champions with traditional Chinese weapons. We use 21st century smarts to keep every workout new again. And to this day, all the world admires a kung-fu st udent's vibrant energy and special kind of poised self-confidence. Read more about our specific classes for adults and children then visit one of our convenient locations listed below. Feel free to contact us with any questions.